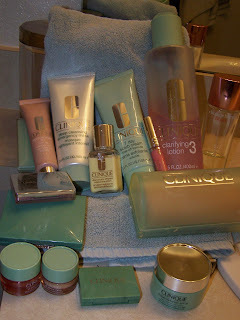 Yes, this is just SOME of my beloved Clinque products. Although there are 2-3 "trial," items in there, the rest of the stuff is used in my daily/near daily routine. I use some under the eye lotion, (those little two vials in the front,) to help combat my 'allergy eyes.' And then I put a dash of Clinique HappyHeart on. Then, in my makeup routine, I use a light foundation, powder, blush, and sometimes eye shadow, all made by the wonderful Clinique. I don't use their lip stuff, beause I haven't found one that leaves my lips feeling non-sticky, but let me know if you know of one of theirs that is non stick! And, in the evening, I repeat the first step, and then go onto using a Face Scrub, and then an "emergency mask," every three to four days. And, I believe, that all of their products are nonscented (except for the perfume, because that would be stupid,) and hypoallergenic. I really want to try out their mascara, and their solid lip stick. We'll see! Have you tried the Almost Lipstick? I LOVE that stuff!! The color Black Honey is a huge fav of Angela's and mine- great color and just flat out makes a tired face look pretty! Someday, when you're a tired momma- you'll get what I mean! Love and miss you bunches!